Stepheni found California AgrAbility through the National AgrAbility Project. When she discovered CalAgrAbility, she sent in a self-referral through the online portal. Stepheni was bit by a deer tick right before she was deployed for duty. She suffered symptoms of Lyme disease for 2 years before she was diagnosed. By the time of her diagosis, her Lyme disease had progressed causing degenerative arthritis, scaring in her lungs, and had started eating her jaw bone. After a year, she was declared as a 100% disabled veteran, enabling the military to relieve her from her duty. To help with her illness, Stepheni’s doctor wanted her to eat fresh fruits and vegetables. However, it quickly became apparent that it was hard to obtain it in her area. As a result, Stepheni started her own urban farm planting a variety of herbs and vegetables. With her condition, it was hard for Stepheni to stand up after weeding, seeding, or tilling on the ground. 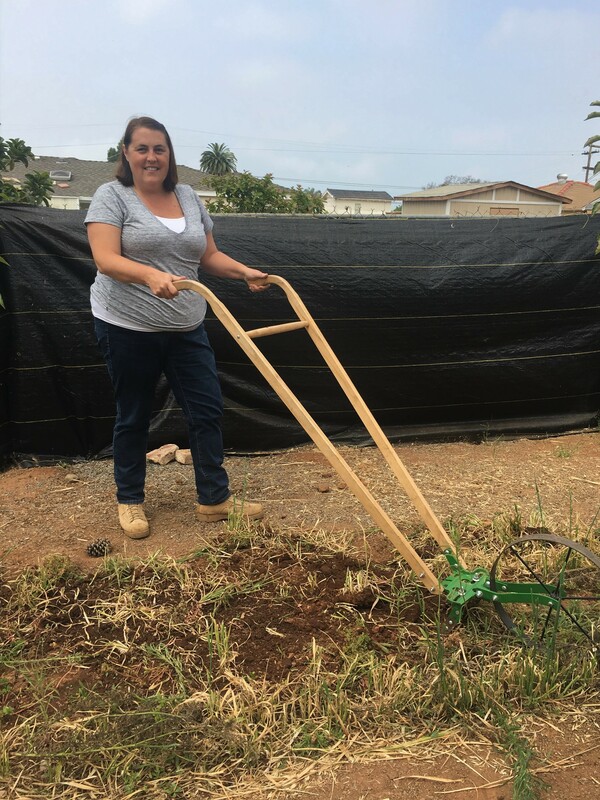 CalAgrAbility staff suggested the Hoss Wheel Hoe and Farmer’s Friend Quick-cut Greens Harvester, which allowed Stepheni to farm without having to get on the ground. These tools were the perfect solution allowing her to work her farm for 6 hours without feeling any pain. CalAgrAbility collaborated with the DOR to purchase the assistive tool for Stepheni without her having to spend a dime. Stepheni can now work effectively and safely producing fresh material not just for herself, but also restaurants and chefs in her area.